Australian Standards require that equipment or structures be designed according to a specific standard. We at Dynamic Engineering makes this process as easy as possible for our clients by providing a design certification service. There are several different ways in accomplishing this, through physical testing of equipment and computer simulations, such as Finite Element Analysis. Computer assisted stress analysis streamlines the certification of equipment. A 3d-computer model takes the guesswork out of new designs. Changes can be made quickly and inexpensively and the result can be checked straightaway. With Finite Element Analysis (FEA) different loads can be applied, including gravity, remote force and torque. The resultant stresses and deflection can be checked against design specifications. Actual load test to confirm the design calculations and construction. We can help with all of the above. By developing a 3D model of your equipment and applying the loads, we can produce a stress plot that can be used to prove the design or even to increase the reliability of the design. It is fast, cost effective and saves a lot of time and money associated with breakdowns – not to mention the safety risks associated with failures. In some cases we are asked to give our opinion if certain maintenance activities would be safe. One such assignment was to check if a corroded tailing pipe could be lifted while in operation. Our analysis showed this to be a high risk activity and we advised our client against this – showing areas of concern as well as the behaviour of the model under certain load cases. With our model we were able to predict load versus deflection curves, as well as the required crane tonnage. Although our analysis indicated that the lift should not take place, our client still received the benefit of avoiding a large clean-up bill and other associated incidents. Sometimes it really pays to check out the engineering aspects of a job before it is attempted. 1) Constructed from large welded assemblies that can be transported easily and that would minimise construction time on site – modular. 3) Open sections to make it easy to monitor corrosion and damage. 4) Capable of handling certain site vehicles. 5) Fully compliant with the relevant Australian Standards. 7) Incorporated vehicle wheel guides (safety). 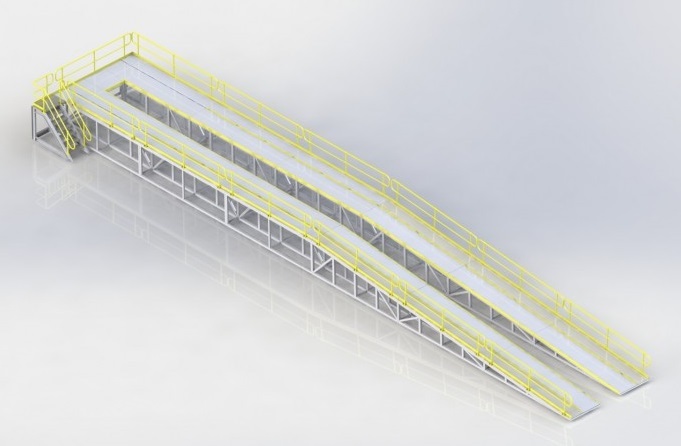 The final design for this ramp is shown below. 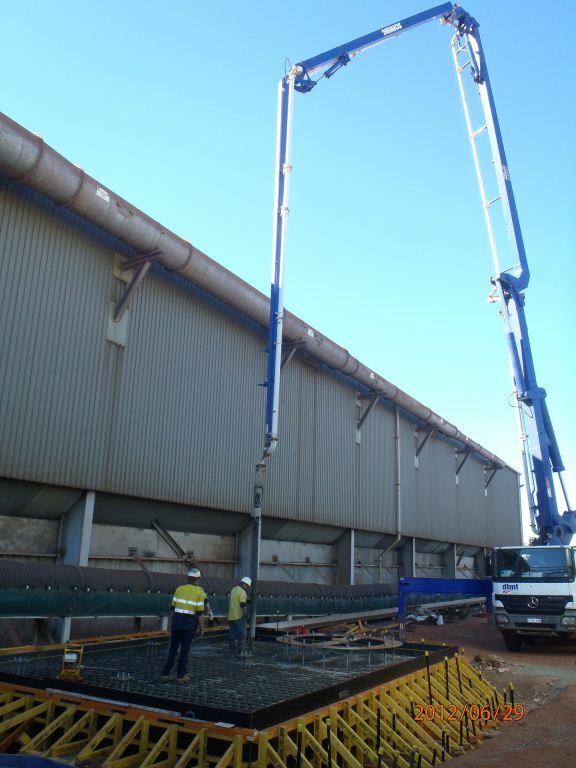 It complied with all of the above requirements and is currently installed at a few minesites around WA. It was constructed in four large sections that was bolted together on site with splice plates and was also attached to the concrete with mechanical anchors. The all-important feedback that was received from our clients are very positive. The ramp was easy to transport, easy to install, had a quality construction and was easy to use. It is an example of a simple design that just works. A hopper collects ore, which typically falls from an overhead conveyer or is dumped by a belt feeder into the bin. This causes dynamic loads and stresses, which need to be taken into account when designing the hopper. 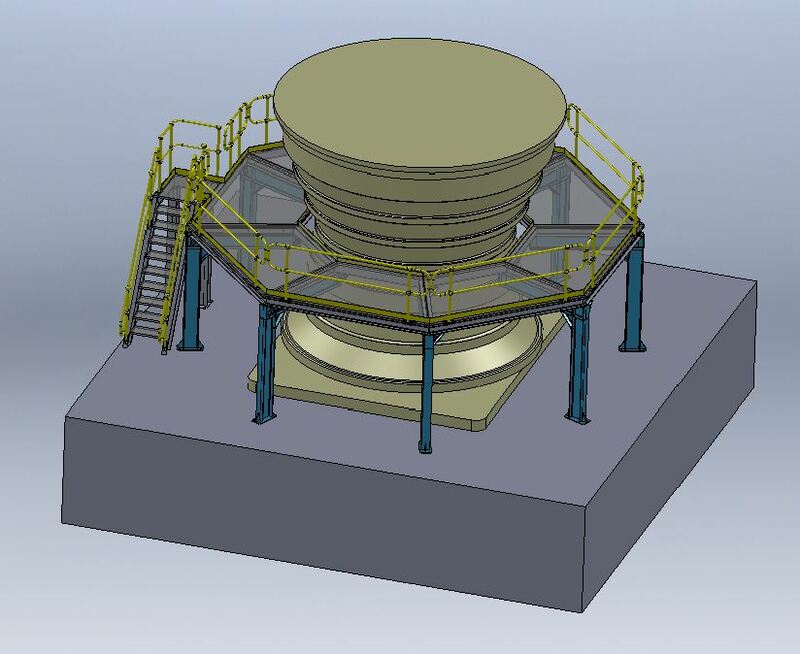 Dynamic Engineering analysed our client’s proposed design and found that it would require strengthening in order to reliably withstand the imposed forces. With relatively cheap modifications, a more robust design was implemented – saving our client on future repair and maintenance costs. A radiation source cradle was designed to assist plant metallurgists to easily and safely move radiation sources around inside a process plant. Due to the weight of the source the cradle was designed to that it can be carried by two people. The cradle weight was kept low by using aluminium for its construction and was fitted with spacers that made it multi functional. It was also furnished with a stainless steel nameplate that contained information regarding the load rating and use. Dynamic Engineering also provides a civil or structural design service. Below are some examples of our recent work. Have you got a similar requirement? Give us a call today. Refer to our “contact-us” section for ways to contact us and discuss your requirements. The forklift ramps shown below are used for loading and unloading of food trucks. These ramps were fabricated by others some time ago and were never rated for a safe working load / engineered and thus needed to be certified for a specific capacity. An analysis of the Forklift and Access Ramp Design was done by Dynamic Engineering Consultants. It indicated that the ramps were indeed not fit for purpose as it did not comply with the relevant standards in relation to the required load rating. Dynamic Engineering recommended modifications to the ramps to ensure compliance and issued a design report based on the proposed modifications (certified the proposed design). The revised and upgraded ramps are shown in the second picture below. The new design incorporated design improvements where required (upgraded pin connections and sleeves), and also included some safety recommendations (“keep-clear” areas added). Through our involvement in this project we were able to provide value to our client by: 1) Improve the existing design in terms of safety 2) Provide the required paperwork required by the mines safety inspector. At Dynamic Engineering we understand that our clients are always pushing to improve productivity, whilst at the same time reducing maintenance related delays. After all, production is the name of the game. Dynamic Engineering can help with process improvements. We also understand that sometimes plants have not been optimised and that a relatively small production bottleneck can make a big difference to the overall productivity of a process plant. We can help by improving throughput by resizing slurry pumps and piping systems – whilst still keeping impeller tip speeds low enough to achieve satisfactory wear rates. We can perform detailed slurry or water pump calculations, design pump foundations / skids and provide a custom solution to your problem.